...and I would like to know the scientific name." I can try to determine your sample. This service is completely free, also for consulting companies. Since I receive almost weekly requests, digital imagenes or even samples, I kindly ask you to lookup the following checklist. Sending some digital photos (greyscale is sufficient) is a good idea together with some data on the stratigraphy / facies. Do not send more than three files that are not larger than one MB each by email. In order to send larger and/or more files please use a service like wesendit.com, but not dropbox. Images must have a scale (or an indication of the resolution) and a number for reference. It does not make much sense to send uncut, unpolished specimens; it is almost impossible to determine them. Try to prepare a polished surface or to obtain a thin section. Please do not send any material without contacting me beforehand. I will provide a valid address. Never ever send any sample to Mexico. I have to pay importation tax. When sending material to abroad please do not declare them as "corals" or "fossil corals"; please declare them always as "rock samples". locality of the samples as exact as possible. No problem if you do not dare to tell me the exact spot. You are right: if your samples are nice, I would go there and take everything. a clear statement whether I am allowed (1) to make a small polished section (2) to cut the specimen, and (3) to make thin section(s). Thin sections are sometimes necessary for correct determination and will be returned with the samples to you (or what remain). Give me at least six months. Determination may be easy, but sometimes I cannot send your samples immediately back to you (I prefer to send it from Europe or the USA). When I would like to use your samples for a publication, I will contact you beforehand and ask for permit. I will not publish anything without your OK. Larger faunas I normally publish together with the owner or collector of the samples. This usually does not take much time if the material is once prepared. For this, please look up additional information. Download RTF file with sample label. 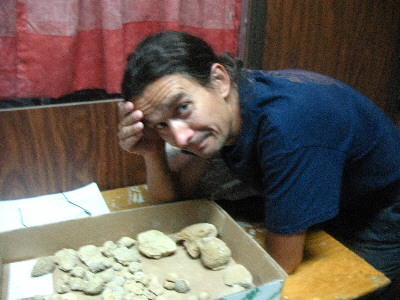 Thanks to José Juan Jiménez for taking this picture when I was observing some really uggly samples. What we can learn from this ? Do send only well preserved material.